On this date in 1954, Texas Instruments announced plans for the Regency TR-1, the first consumer transistor radio. The typical portable tube radio of the 1950s was about the size and weight of a lunchbox and was powered by several heavy, non-rechargeable batteries. A transistor radio could fit in a pocket, weighed half a pound, and was powered by a single compact 9-volt battery. When it went on sale on November 1, the Regency TR-1 cost $49.95. Although its price was high in terms of 1950s dollars, nearly 100,000 of the pocket radios were sold in a year. 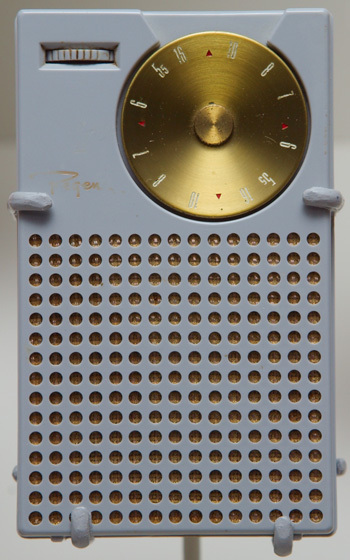 The transistor radio remains one of the most popular communications devices. Some estimates suggest that there are more than seven billion transistor radios in existence. Among other things, this is also National Chocolate Cupcake Day/a>. Rolling Stone magazine presents the ten most WTF Florida Man stories of 2016 (so far). Some people born on October 18 who said some interesting things: Melina Mercouri, Lotte Lenya, Henri Bergson, Pierre Elliott Trudeau, Charles Stross, Chuck Lorre, Terry McMillan, Wendy Wasserstein, Laura Nyro, A.J. Liebling, Logan Pearsall Smith, and Matthew Henry. About 200 people walked out of an Amy Schumer show in Tampa, Fla., on Sunday after she criticized Donald J. Trump onstage. In a statement to Vanity Fair, Ms. Schumer wrote: "I want to thank the 8,400 people who stayed. We have always depended on comedians to make us laugh and tell the truth. I am proud to continue that tradition." You go, girl. Turns out we should be more worried about the Canadian border. Weather forecasting is another area in which the United States has lost its lead. Last year the Air Force began paying Britain's Met Office $100,000 a year to license its weather-modeling software. Doctors Without Borders rejected a million doses of free pneumonia vaccine on principle: Donations... undermine long-term efforts to increase access to affordable vaccines and medicines. They remove incentives for new manufacturers to enter a market when it’s absorbed through a donation arrangement. We need competition from new companies to bring down prices overall?—?something we don’t have currently for the pneumonia vaccine. How did Walmart get cleaner stores and higher sales? It paid its people more. Years of lying have sown the seeds, and the crop's coming in: 41 percent of voters say election could be 'stolen' from Trump.